Turkey's assistance to the Islamic State goes beyond providing open borders for ISIS militants. 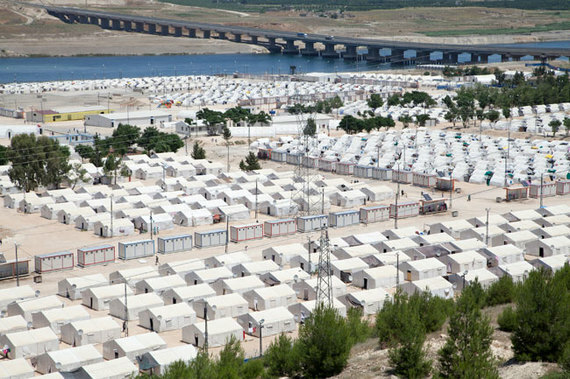 By the end of 2015, Turkey is expected to host as many as nearly 2 million Syrian refugees. The country opened its doors to create a "safe haven" for those fleeing persecution, many of whom ended up moving to cities on the Syrian-Turkish border, such as Hatay and Gaziantep. The Turkish government has strongly criticized Syrian president Bashar al-Assad, whom it blames for the deaths of up to 350,000 people since the Syrian Civil War began in 2011. However, Turkey's policy of accepting Syrian refugees -- as well as allowing arms shipments and rebel fighters to pass through its borders -- is taken advantage of by foreign jihadists intent on joining ISIS. The influx of refugees has also put a strain on the country's resources, as seen in its increasingly frequent food shortages, poor housing and a lack of other necessities. Turkey's role in the Syrian crisis cannot be refuted. As David Ignatius wrote in The Atlantic, Turkey, in failing to tighten its southern border, became a gateway for ISIS and Jabhat al-Nusra (Al-Qaeda In Syria). The conflict is prolonged by the support extremists enjoy from neighboring countries. It would be prudent to peg the blame for this support on Turkey's poor border control. Turkey's assistance to the Islamic State goes beyond providing open borders for ISIS militants. Recently, Turkey was accused of being one of the main sources of financial backing for the Islamic State, as well as of providing the majority of the group's training and weaponry. The Islamic State, for its part, has been making a profit smuggling oil across the border into Turkey. ISIS makes between $1-2 million a day from oil revenues, and Reyhanli, one border village, made a profit of more than $800 million in oil sales over the course of 16 months. Residents near the Syrian border reported witnessing Turkish ambulances going into combat zones during clashes between Kurdish militias and the Islamic State. These ambulances would evacuate ISIS casualties and would treat them in Turkish hospitals. The ISIS commander Abu Muhammad, for example, was receiving treatment in a Turkish hospital in Hatay. In the past few years, the Islamic State of Syria and Iraq (ISIS or Da'esh) has shaken the world with its ruthless tactics. The United States and its allies are determined to contain and ultimately defeat the Islamic State. But Turkey is prioritizing its own national interests in the region -- that is, the removal of Assad and the destabilization of Kurdish militias -- and has assisted ISIS to these ends. The The Turkish government's indirect support of the group, as confirmed by a former ISIS sympathizer, enables ISIS fighters to walk freely through Turkish territory. This privilege serves to strengthen them in their fight against Kurdish forces, and in so doing, further Turkey's own goals. Turkish military activities in Syria have been solely geared towards toppling the Assad regime, namely by openly supporting the Syrian opposition. Under the sponsorship of Turkish non-governmental organizations (NGOs), such as Mazlum-Der, and with the approval of the Turkish government, these opposition groups have been allowed to gather in Istanbul. The United States, like Turkey, has also been a zealous supporter of ousting the Assad regime, and has made it clear that it only supports moderate rebel groups. But Turkey does not have any reservations in achieving this goal. It allows itself to be used as terrorists' main route into Syria, and jihadists from all over the world now enter Turkey to fight in the Syrian conflict. Turkey's doors are open to any militant who pledges to fight against the Assad regime. As a rising hegemonic power in the region, Turkey is an important player in Middle Eastern foreign policy, specifically with regards to Syria. The situation in Syria would be better now if Turkey had been persistent with holding diplomatic talks with Assad, even if a mutual consensus was never reached. Instead, by keeping its borders open, Turkey allowed an influx of foreign fighters to enter in Syria and cause further destruction. Political stability in Syria is essential to achieving peace in Turkey. But Turkey's noted financial backing of paramilitary activities in Syria is disturbing. Fighting terrorism in any country or region requires a unity of purpose, rather than each faction acting in its own self-interest. Turkey has supported ISIS in Syria and Iraq without considering the socioeconomic consequences that would befall it. The Turkish government gave firearms to rebels, allowed them a route into Syria and let them traffic oil in through the Syrian border. It is clear that violence and unrest in Turkey, including that seen during the the recent Turkish elections, stems from resistance against the government's stance towards ISIS, its support of the Syrian opposition faction and its actions behind Syrian borders. The public perception that Turkey supports ISIS through intentionally negligent border control -- and the subsequent discontent amongst Turkish citizens, who are now competing for resources with refugees -- was bound to cause civil unrest in the country. The Syrian Civil War, which began as an uprising to overthrow the Assad regime, has devolved into a proxy war, with Turkish-backed jihadist forces serving as the main anti-Syrian opposition. Could the Islamic State have become this powerful without Turkey's assistance?